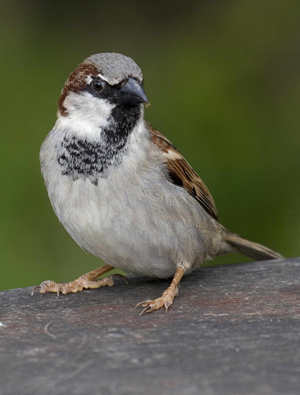 The disease known as Salmonellosis in garden birds is typically caused by the bacterium Salmonella typhimurium. Many different species of Salmonella exist, some of which may be carried by or cause ill health in wild birds. Some may also affect humans. The Salmonella bacterium typically causes disease in the gullet, with generalised infection of the liver and spleen common in many cases. Affected birds show general symptoms of ill health (such as fluffed-up plumage and lethargy) and, since these are similar to the symptoms of certain other diseases, diagnosis invariably requires post-mortem examination. Salmonella bacteria are somewhat robust and can persist in the wider environment for some time. The primary route of transmission is believed to be infected bird droppings which then contaminate food or water. The strains of Salmonella typhimurium that affect wild birds have the potential to affect humans and other domestic animals (including pet dogs and cats). Follow sensible hygiene precautions as a routine measure when feeding garden birds and handling bird feeders and tables. Clean and disinfect feeders and feeding sites regularly. Suitable disinfectants that can be used include a weak solution of domestic bleach (5% sodium hypochlorite) or other specially-designed commercial products. Always rinse feeders thoroughly and air-dry before re-use. Rotate positions of feeders in the garden to prevent the build up of contamination in any one area of ground below the feeders. Empty and air-dry any bird baths on a daily basis. Get more advice on hygiene measures. If you wish to report finding dead garden birds, or signs of disease in garden birds, you can do so through Garden Wildlife Health, our online reporting system.